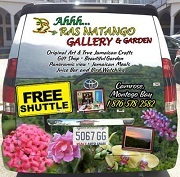 Ahhh Ras will pick you up from your Montego Bay hotel in their own FREE shuttle. So, when in Montego Bay, don't miss the opportunity to to find out about Ras Natango the artist, and the "The Bird Lady of Ahhh...Ras" who seems to have some magical connection with nature. Wild birds perch in her hand, turtles emerge from the sea and lay their eggs right beside her on the beach, her gardens, built on a rock filled hillside, are the envy of those who have the best of soils. What is the mysterious attraction that ALL nature seems to have for her? There is only one way to find out, and that's to visit Ahhh...RAS NATANGO Gallery and Garden﻿, where you can also tour the studios of Ras Natango, Jamaica's world famous artist. To arrange your visit, or to just ask Ian, Tamika, or Ayale any questions that you may have ... please complete the form below. They will reply directly to you at the email address you give.